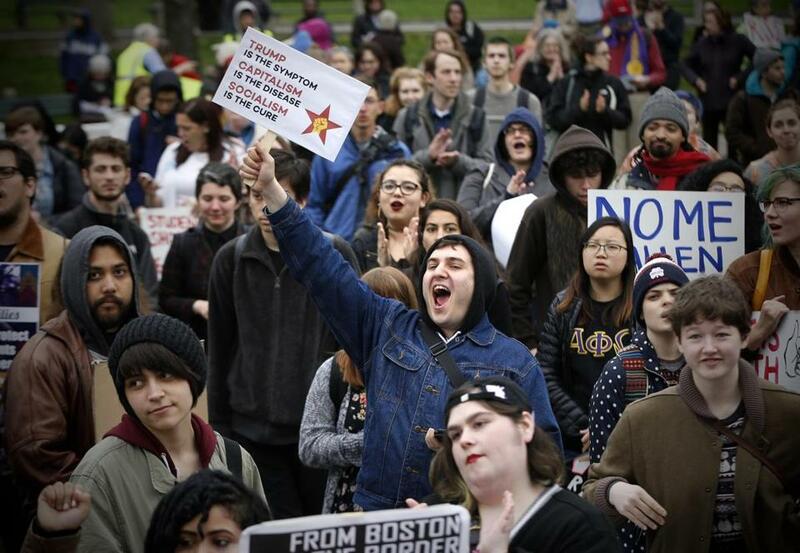 People cheered during a rally to support immigrant rights on Boston Common Monday evening. Maria Monterola shut down her East Boston tailoring shop for the day on Monday — a decision that’s likely to cost her several hundred dollars, as well as a few clients. But Monterola, who is originally from El Salvador and closed her doors to support the “Day Without Immigrants” strike, said the sacrifice is worth it. Monterola’s business, which also handles wire transfers and UPS packages, was among an estimated 50 mainly immigrant-owned establishments — many of them restaurants, markets, salons, and boutiques — that closed for the day in East Boston and Chelsea, strike organizers said. Hundreds of local immigrants didn’t show up for work, they said. The actions took place on International Workers’ Day, also known as May Day, and were part of a global day of worker protests. In the United States, the actions revolved around President Trump’s crackdown on immigrants and sought to draw attention to the vital role they play in the workforce. 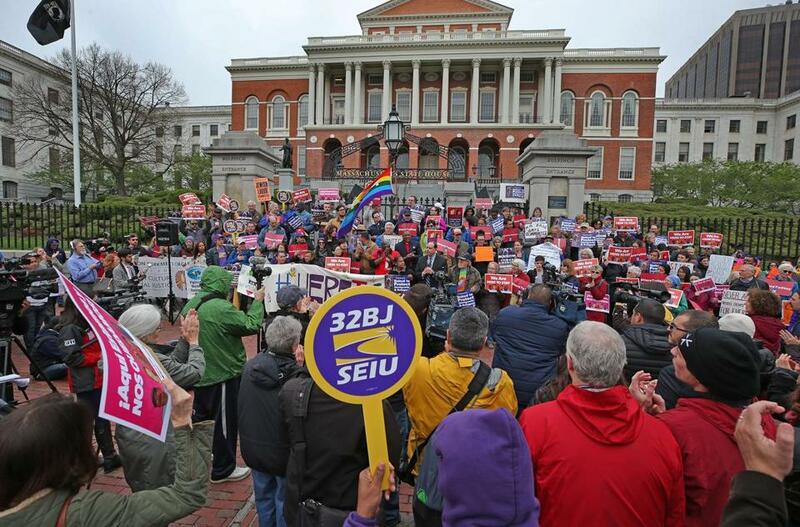 Numerous marches and rallies took place around Massachusetts, and in the Boston area, union and community leaders joined immigrant advocates for a midday demonstration at the State House and a late-afternoon march to Chelsea City Hall. The strike was the second such action since Trump took office, following a social-media-driven effort in February, and the latest in a series of nationwide protests over Trump’s policies. More than 5,000 businesses around the country committed to closing on Monday, according to Cosecha, a group working to win protection for undocumented people that helped organize the strike. Demonstrators rallied at the State House Monday. The immigrant rights movement has been building over the past decade, but there is new urgency since Trump was elected, said Annelise Orleck, a history professor at Dartmouth College who studies immigration and low-wage workers. “I think what we’re seeing now is a quantum leap to the next level,” she said. People born outside the United States make up about 17 percent of the labor force, according to the Bureau of Labor Statistics, with Hispanics accounting for nearly half of those workers. Immigrants are more likely than US-born workers to work in the service industry, many of them in restaurants, as well as in agriculture, maintenance, and construction. When construction worker Ricardo Contreras told his boss he wouldn’t be at work May 1, he was fine with it, Contreras said. Asked if his job was secure, though, he shrugged his shoulders. Contreras came to the United States from Guatemala when he was 19 to take over for his father, who had been working construction jobs in the United States to support the family. Now Contreras, 28, is the breadwinner, sending home as much as $700 a month. Giving up a day’s wages will hurt, said Contreras, who also teaches salsa dancing and hopes to study computer science one day. But he felt compelled to stand up and fight, even as deportation fears grow around him. In less than four months in office, Trump has taken numerous actions causing concern in the immigrant community. He signed an order to ban travel from six predominantly Muslim countriesand temporarily stop refugee resettlement, which was halted by the courts. He called for the construction of a southern border wall and thousands of new border agents, and threatened to yank funding from jurisdictions that don’t cooperate with federal immigration authorities. He increased arrests of undocumented immigrants from the year before and doubled the number of noncriminal immigrants arrested. “Our president is unfortunately whipping out all sorts of anti-immigrant stances that are causing people real fears,” said Marisol Santiago, executive director of the Restaurant Opportunities Center of Boston, which helped organize the strike. At a demonstration in Lawrence, a group of teenagers stood in the middle of Campagnone Common as demonstrators drummed, sang, and chanted around them. The girls had skipped school — with the blessing of the superintendent, who said students who didn’t come to class wouldn’t be penalized — to represent their parents, who came to the United States from the Dominican Republic. Some of them had been deported years before; others had bosses who refused to let them take the day off. Sisters Laisha and Sarah Calcano recalled how their mother struggled with homelessness when she first arrived. Now, she is a US citizen working in a donation center. Dina Hernandez said she was demonstrating for her mother, who came to the United States so her children could have a better life. The girls said they also wanted to be somewhere they felt welcome, after weeks of hearing government officials call immigrants criminals. 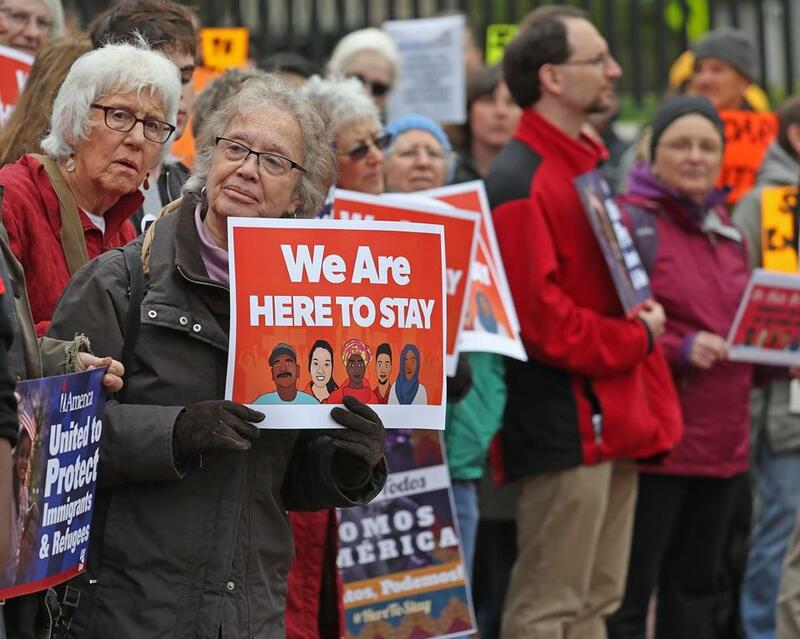 Union and community leaders joined immigrant advocates for a rally at the State House Monday. Katie Johnston can be reached at katie.johnston@globe.com. Follow her on Twitter @ktkjohnston. Maria Cramer can be reached at maria.cramer@globe.com.